Happy Friday! Hope you are having a wonderful day so far. Today's Friday Mashup is brought to us by Lesley and this time of year, when we are all winding down from the holidays, I think this is a great challenge. She wants us to make a thank you card, a project using DSP/patterned paper or mash it up and do both! Of course I went ahead and mashed it up! Make sure you head over to the Friday Mashup blog to see all the other great cards from the design team and then be sure to link up your card to play along with us! No surprises here Lisa, knowing your snow addiction is currently being fed. Usually mmost snowman cards I see relate to Christmas, so this is a lovely change to see a thank you card. Love your colours. oh my, this is sooooo cute...luv it! 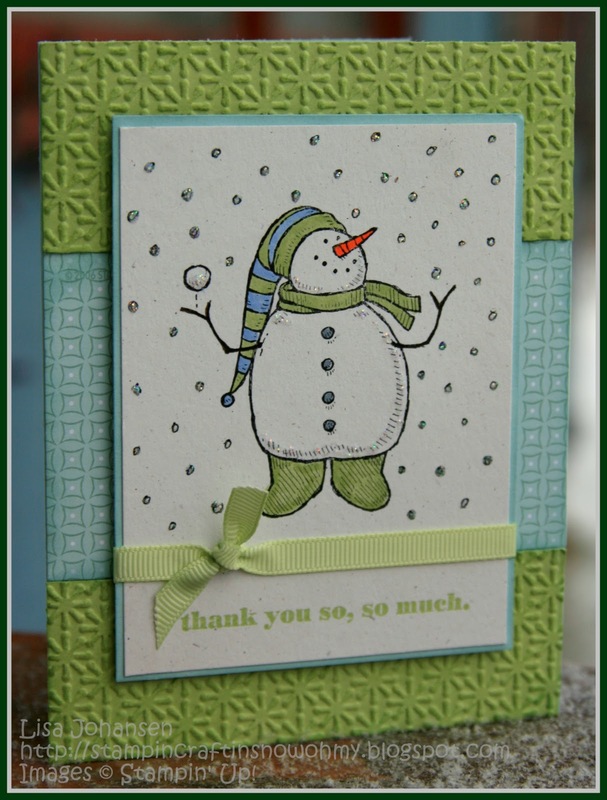 A snowman card is perfect for January! Seeing as how you are up to your eyeballs in snow it's perfect.. 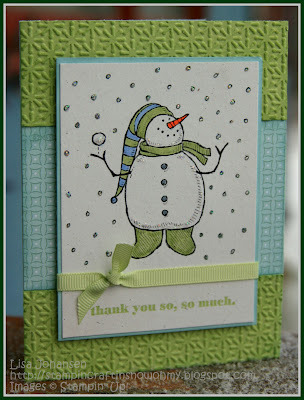 I love the color combo you used and that snowman is too cute! I really need to get some snowmen for my stamp collection! Love this card, that snowman is adorable. I love the colours you used Lisa! They are fresh and oh so cute when paired with that snowman. Merry Penguin for Merry Monday!